Middlebury students may be in the library on Sundays, but Fridays and Saturdays are a bit of a different story. One of the things about Middlebury that most surprised me as an incoming first-year was the fact that most students do not leave Middlebury on the weekends, with some exceptions such as in-season athletes travelling to compete. I thought that I would be spending a decent amount of time in Burlington (45 mins) and Montreal (2.5 hours). I’ve only been to Burlington a few times and Montreal probably the same amount. Other than those few short trips, I’ve spent my weekends here. What can a town of 8,000 (Middlebury) offer that an international metropolis of 2 million (Montreal) can’t? A good place to study, you may joke. That’s true. However, Middlebury realizes that it doesn’t have 2 million residents and that it has to work harder to keep students entertained. To this end, the College and students themselves take it upon themselves to offer a wide range of weekend activities for students with a variety of interests. Take this past weekend, for example. Friday night, Inception was screened three times in Dana Auditorium as part of the Free Friday Film series. The Free Friday Film Series is a series of recently released films offered free to students by MCAB (Middlebury College Activities Board), the student-run activities board. After Inception, my suite hosted the pirate party, an annual tradition of the Sailing Club. The Sailing Club is a three-part program: it runs a PE class, offers a recreational sailing program that allows anyone to get out on the water, and competes in regattas as a member of the NEISA (New England Intercollegiate Sailing Association). The team is incredibly tight, even when they’re mock fighting in pirate garb (witnessed Friday night). Saturdays are usually fairly relaxed. This past Saturday, you could’ve gone down to Alumni Stadium, gotten involved in a tailgate and watched the football team end their season with a win over Tufts. On any given weekend, you could grab a few friends, hike Snake Mountain and spend a while admiring the beauty of the Champlain Valley. You could also explore town, pick up some fresh cheese at the Farmers Market, grab a sandwich at Noonie’s and eat it overlooking the falls on Otter Creek. This past Saturday night, MCAB brought us Yeasayer. They gave a great show with the crowd going especially wild for one of the lead singer’s jumpsuit. 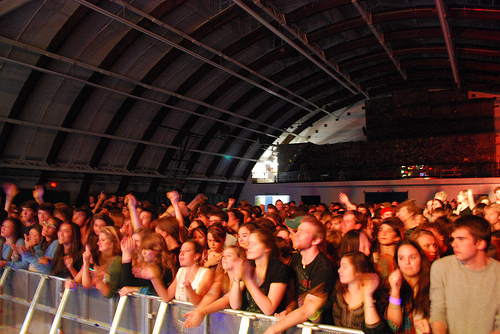 MCAB is able to bring a lot of great acts here for concerts. In recent years, we’ve seen: The Roots, Girl Talk, Regina Spektor, and many more. This past Sunday, a lot of people skipped the library (at least for a while) to watch the mens’ soccer team win the NCAA DIII regional championship. The soccer team will advance to sectionals next weekend, hopefully moving onto nationals after that. The team is no stranger to the NCAA DIII National Championship, having won it in 2007. As you can see, Middlebury doesn’t give students much reason to want to leave campus. That said, I will be going up to Burlington tomorrow to see the midnight showing of the latest Harry Potter. Pumped. This entry was posted in Student Life, Vermont and tagged athletics, Burlington, campus culture, concerts, food, football, Free Friday Films, fun, hiking, Inception, MCAB, Montreal, NCAA Division III, Noonie's, soccer, Student Organizations, weekend on November 17, 2010 by Vincent Blais.